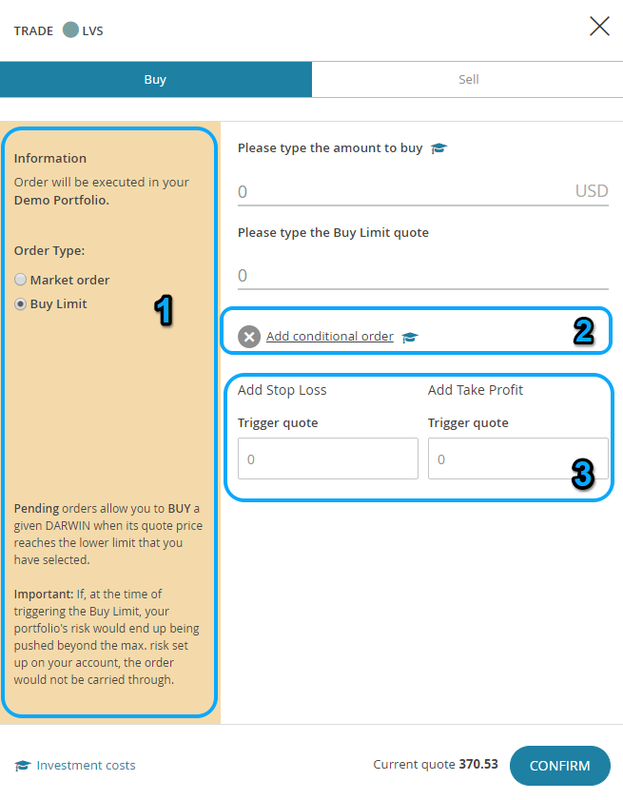 Conditional orders are orders which are not immediately executed to the market, because the quote price has to reach a certain value before the order is triggered. At Darwinex, the conditional order are pending until the DARWIN reaches a certain quote price, in which case the order is automatically executed. We can distinguish four types of conditional orders. A Buy Limit order is to buy a DARWIN at a quote price lower than what it is right now. This option is used by investors who want to make the most of a fall in a DARWIN in order to buy ''cheap''. A Buy Stop order is to an order to buy at a higher price, in other words it is used to buy a DARWIN at a quote price higher than what it is right now. This order is used by investors who want to make the most of the momentum of a specific DARWIN. A Take Profit order is to sell a DARWIN when the quote price is higher than what it is right now. A Stop Loss order is used to sell a DARWIN when the quote price is lower than what it is right now. How does this work at Darwinex? Let's look at how to place conditional orders at Darwinex. Conditional orders can be placed from the web platform, the mobile app "Darwinex for Investors" allows placing market orders only. From the DARWINs Terminal we can view, edit, or delete all the pending orders from the relevant tab. We can place this type of conditional orders at different times, whether it is when you buy the DARWIN or afterwards. Market order. 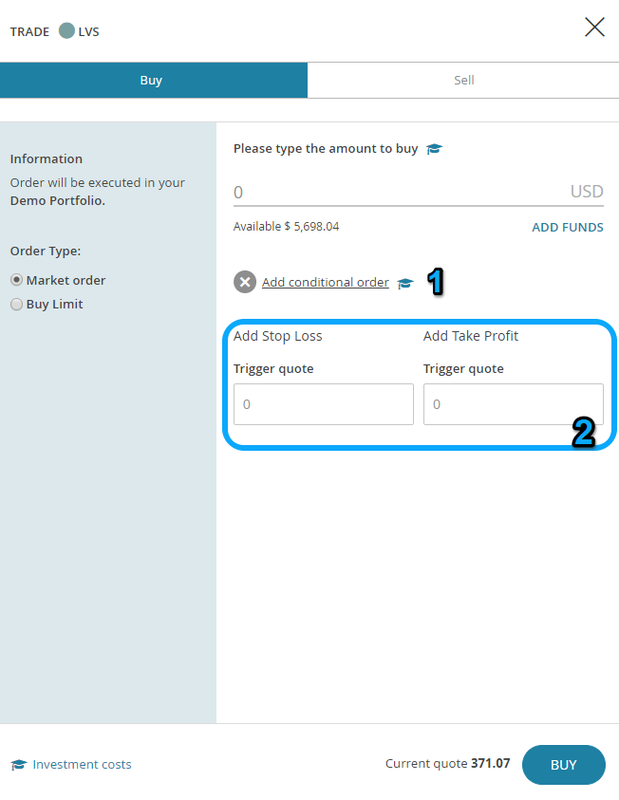 Once we have the ''Trade'' window open, if we want to place a SL or TP with a market order, we have to click on ''Add conditional order'', whereby two options will appear as shown in the image below. Then you can place the relevant SL and/or TP. Buy Limit. 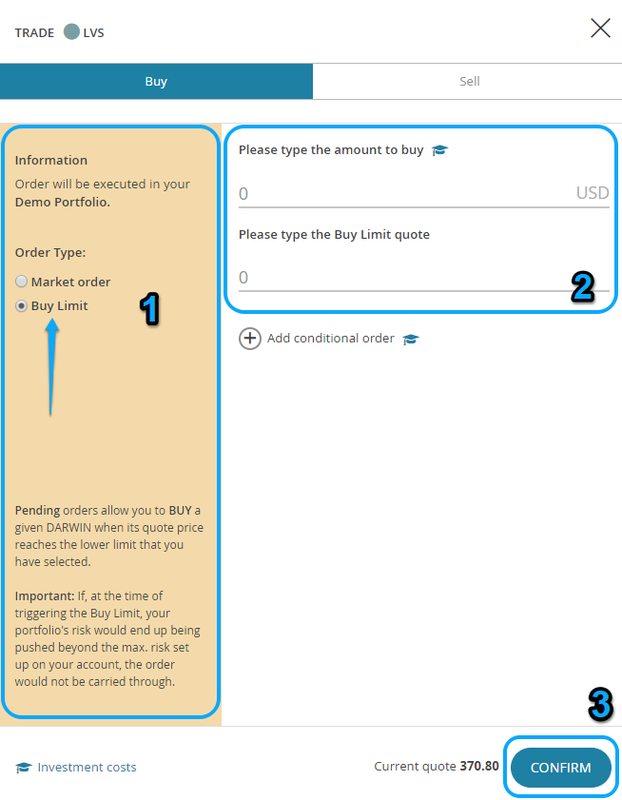 Once we have opened the ''Trade'' window, to place a SL or TP in a Buy Limit, we have to select the type of order ''Buy Limit''. Then we have to click on ''Add conditional order'', whereby two options will appear as shown in the image below, and place the relevant SL and/or TP. Open Investments. This last option would be to set up a Stop Loss or Take Profit order on an investment which we already have in the portfolio. To do so, you just have to go to the DARWINs Terminal, click on the ''Invested DARWINs'' tab and then click on the ''+'' symbol to the right of the chosen DARWIN, as shown below in the image. Despite our risk manager controlling investors' leverage, by setting up a Stop Loss the investor can avoid suffering losses greater than those desired. A 10% monthly VaR implies that, in 1 our of every 20 months, the expected minimum loss would be 10% or MORE. Therefore, a Stop Loss can help us to avoid some ''statiscally unexpected surprises''. Here we will offer some tips about conditional orders. Do not set Stop Losses too tight. 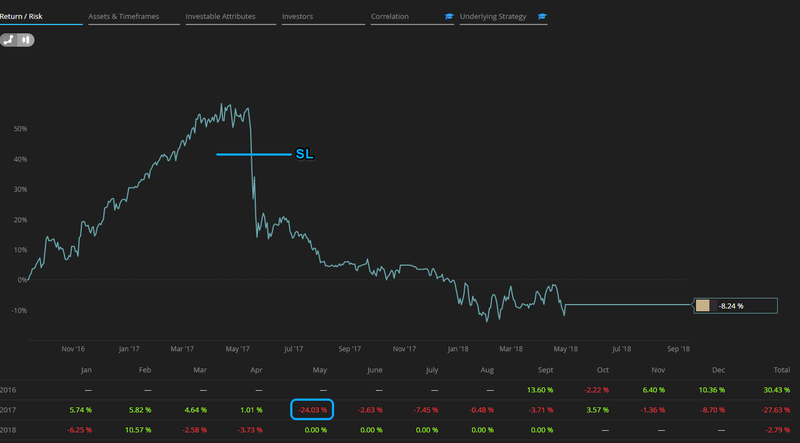 If you decide to have excessively tight Stop Losses, you run the risk of the SL being triggers by the slightest movement of a DARWIN against you, only to have the DARWIN return to its previous position. Therefore, it is not worthwhile placing the SL too close to the current quote price as this could result in the accumulation of many little losses, which can be very harmful for your account's results. Plan ahead when to enter and exit the market. The use of conditional orders means the investor does not have to be always watching the DARWIN's quote price. They are not only useful for reducing the risk but also they can be used to buy a DARWIN at a quote price better than what it currently is, or to take profit once a certain objective has been reached. If you want to learn more about conditional orders, we recommend watching the following webinar recording.